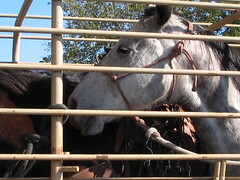 Horse transportation comes in a variety of services and providers. Some specialize in race or show horses. In order to legally transport those specialty horses, these providers must have specific insurance and licensing. Some providers specialize in local transport, while others offer international transportation services. What is the right type for you? Local transport. Local transport can be anything from a ‘taxi’ service to and from the vet, or shipping a horse from a seller to its new owner in a nearby town. While the same considerations for your horse’s health and safety should be taken, shorter trips can require slightly less advance preparation and may or may not require health certificates and brand certificates if the trip won’t change states. Interstate transport. Interstate transport services typically follow a schedule. The schedule can be daily, weekly, or bi-weekly and service a geographic area including multiple states. For instance, a Northwest provider might service Washington, Idaho, and Oregon. While these trips may be relatively short – from a few hours to a day or two – the preparation and paperwork requirements are similar to those of longer distance hauling. Be ready to provide health, brand, and Coggins test certificates for your hauler. National transport. Because of the wide area that is serviced by national transport services, their schedules tend to be weekly or bi-weekly. National transport service requires greater preparation and planning. Shipping your horse for further distances will require more paperwork too. Work closely with your national transportation service to determine the paperwork required. Plan this type of transportation well in advance to provide enough time for certifications, vaccinations, dietary changes, and scheduling. International transport. International transport services provide shipping of your equine to different countries. Any time your horse is transported to or by way of another country, travel requirements can be more complicated. For instance, transporting your horse to Canada (or through Canada to Alaska) requires that any packaged feed or medication be in unopened packages. International transport schedules vary depending on destination and service type. All of the above types of transport are available for show or race horses. Show and race horse haulers require specific licenses, which can be verified with http://safer.fmcsa.dot.gov/CompanySnapshot.aspx. In all instances, the general guidelines for finding a transport service apply: verify credentials, check references, and prepare in advance to assure the safest experience for your horse.